← Friday 12th September 2014 – A quarter is sorted. Now I’m not being dramatic, but it really is very up and down, like most of the roads I was walking on. Today I was doing a practice walk of 26 miles, to see how long it would really take me on the night. I was hoping for anything around the 7 hour mark, give or take a bit. I left home at 9.10am to walk the 26 miles to Nymans, knowing that I’d see Mark and the kids much, much later. This time is wasn’t raining as it had been the last time I’d attempted it back in August, and I was walking a different route. So as I left I was in high spirits, with plenty of food and water to keep me going, and my music fully charged and my directions at hand. Now I knew the first 6 miles very well indeed, so had no need to look at my directions. I was so focused on what I was doing, I nearly walked past someone that I knew really well, and then a little later, came across a lady walking towards me wearing a Shine t-shirt for 2012! We gave thumbs up to each other as we passed. The first 3 and a half hours were fine. The time went very quickly, and I was feeling really great. It was not long afterwards that I hit a brick wall (not literally I have to say). You get to the 14 or 15 miles mark, and it suddenly dawns on you how much further you have to go. It seems like an up hill struggle, and at that point you just can’t see any light at the end of the tunnel. You keep going on and on, but the miles just don’t seem to go down. You are obviously getting further and further, but you feel like you’re walking on the spot. It’s a very weird feeling. Then suddenly you come out the other end and when you look at your watch you realise that you’ve only got about 2 hours of walking left. This time frame makes sense, and you can justify it. So the dark time in the tunnel has gone, and you suddenly feel on top of the world again. For the next few miles, everything seems to be going really well. I went past a pub that had a sign “Food served Dailey! !” Did you spot the spelling mistake? You figure out roughly how many miles you have left to walk, and justify it to walking to a certain place. When I got to 7 miles to go, I thought “That’s from my house to my sisters, that’s not far, I can do that!” You start to map out that walk and because it’s familiar you feel at home, and are able to get your head round it. But then once you hit approximately the 20 mile mark you suddenly start to fall to pieces. Before I go on, let me remind you that the furthest I’ve walked is about 22 miles, so when you get to the 20 mile mark, you know that you’ve only got another 2 miles to go. But when you get to 20 miles and you’re walking 26 miles, well it seems like an eternity! 6 miles is at least another hour and a half walking, which is a really long time. You try to amuse yourself by looking at interesting things as you walk past. For example, strange shaped trees, pretty front gardens, cars that don’t give you enough room when they go past you, I hope you get the picture. 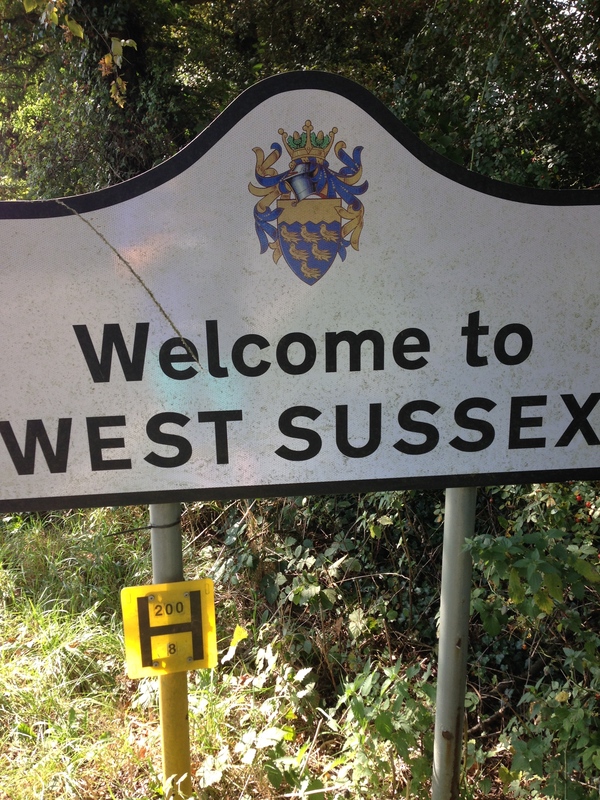 You get excited by the smallest things, like a foot path, and a crossing, maybe even a main road, or waving to aeroplanes flying overhead, even a sign for another county, yes you heard me correctly, I left Surrey and walked all the way into West Sussex!! I had officially left Surrey. This entry was posted in Uncategorized and tagged Cancer Research, claire's allotment, National Trust, Nymans, Shine Walk. Bookmark the permalink.